Holy moly...it is already the second 9 weeks! THMS artists sure are keeping me busy! Check out our Artsonia Gallery to see what they have been working on so far this year! The school year is wrapping up quickly...will you make art this summer? If you want to continue learning and growing artistically, check out the JMU and Larkin Summer Arts programs. There are excellent classes offered for all ages. I definitely plan to make some art over this summer! You should too! I am happy to announce that of the 5 THMS students who entered their work in the Massanutten Regional Library Altered Book contest, 3 of them took 1st, 2nd, and 3rd place! There were over 25 entries, so this is quite an accomplishment! "Alice is Stuck in Wonderland"
Don't forget that Altered Books are due Monday March 31st! If you are entering it in the Massanutten Regional Library Contest, you need to have a parent/guardian sign this form, or one that you previously picked up from me. You can drop it off anytime between now and then, or I will happily bring them there Monday after school (as long as you bring the signed form). I really encourage you to show your work in public as often as possible. It is good a experience to have work on display, and looks great on applications for school clubs and programs! 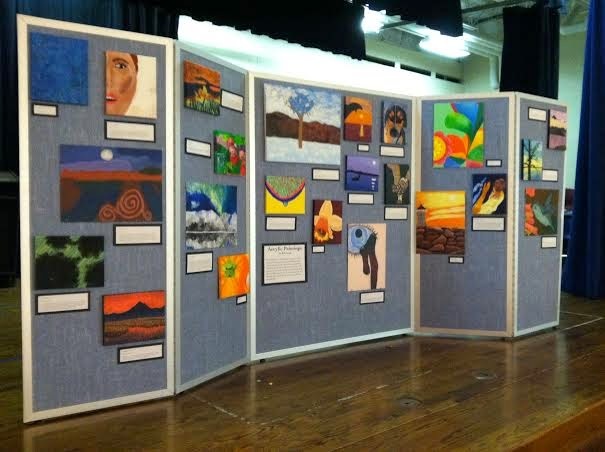 If you DO deliver it yourself, don't forget to check out the district art show on display upstairs at the Massanutten Regional Library until March 31st! 8th Grade Foundations of Art students completed these acrylic paintings after a month and a half intensive painting unit. These were on display near the concessions stand during the musical last weekend and are now on the cafeteria stage. Uh-oh! Ms. Thompson is blogging now? What next?! Being a middle school art teacher is super fun. I love introducing my students to new art forms, methods, and media. But I've been thinking: we only have 45 minute class periods, and most of that time is spent on our projects. When and where can I provide information about other stuff that is happening in our class, our school, our district, our community, and our world?!! So much to learn, so little class time. What is your favorite kind of art, or favorite artist?